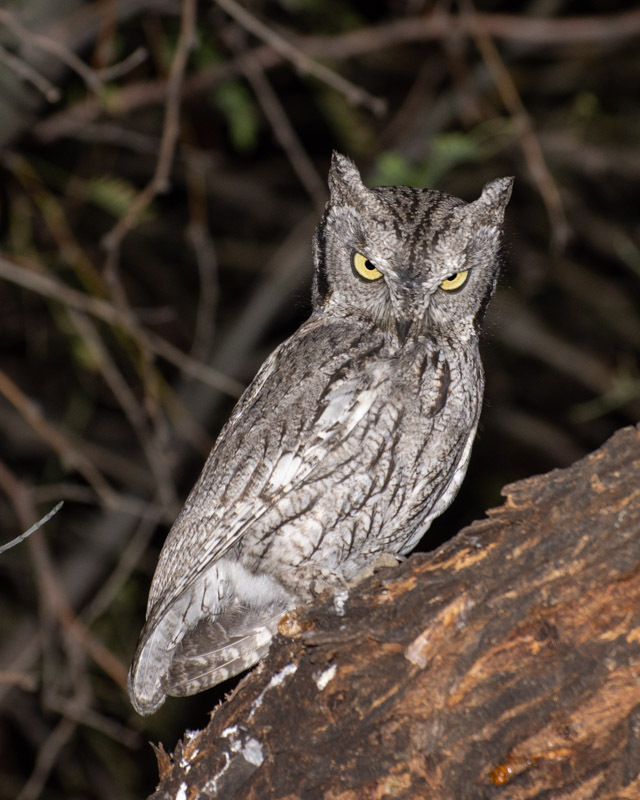 Western Screech-Owls live throughout the Foothills. By now, most have formed pairs, established territories, and are likely on ma nest somewhere. 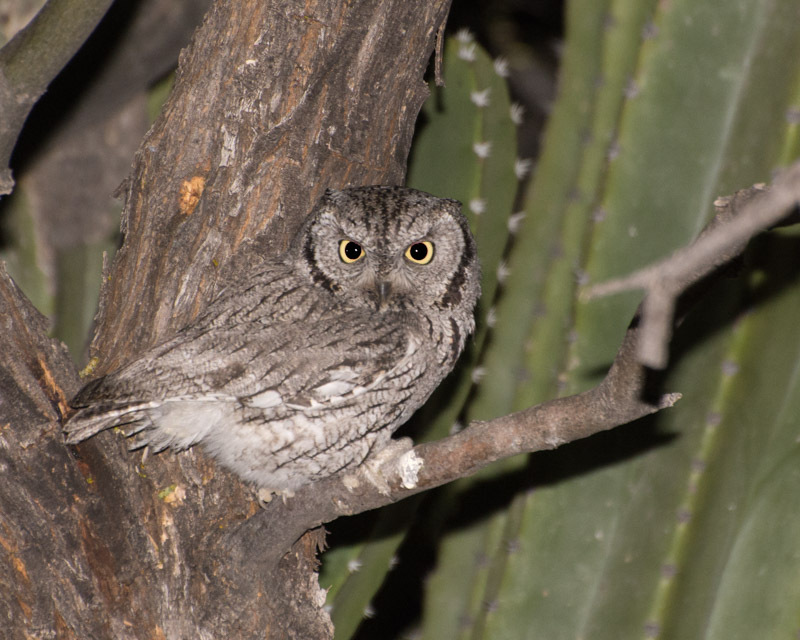 Western Screech-Owls are cavity nesters who use holes in Saguaros, but also tree cavities and manmade “cavities”. 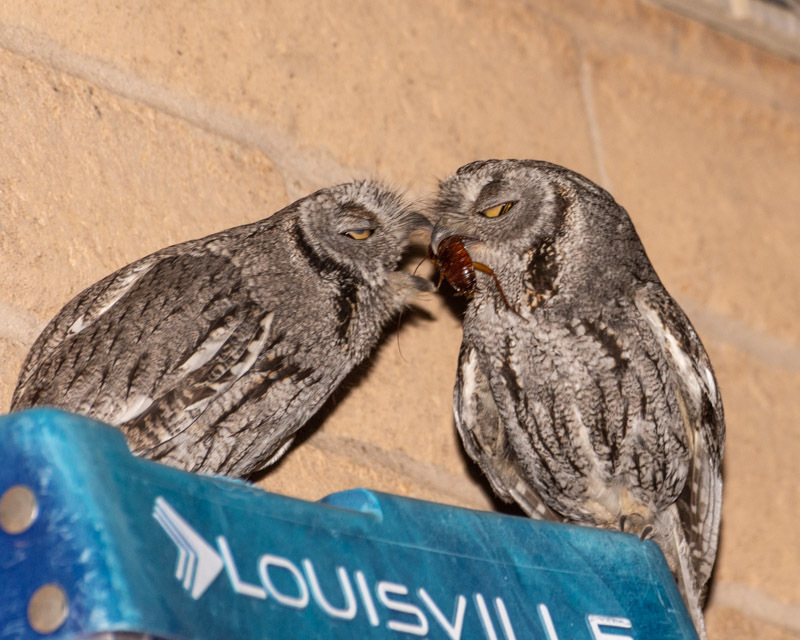 At this time of the year, the owls are probably not ‘dueting’ at night. You may be able to hear the male calling while the female responds with single note barks. 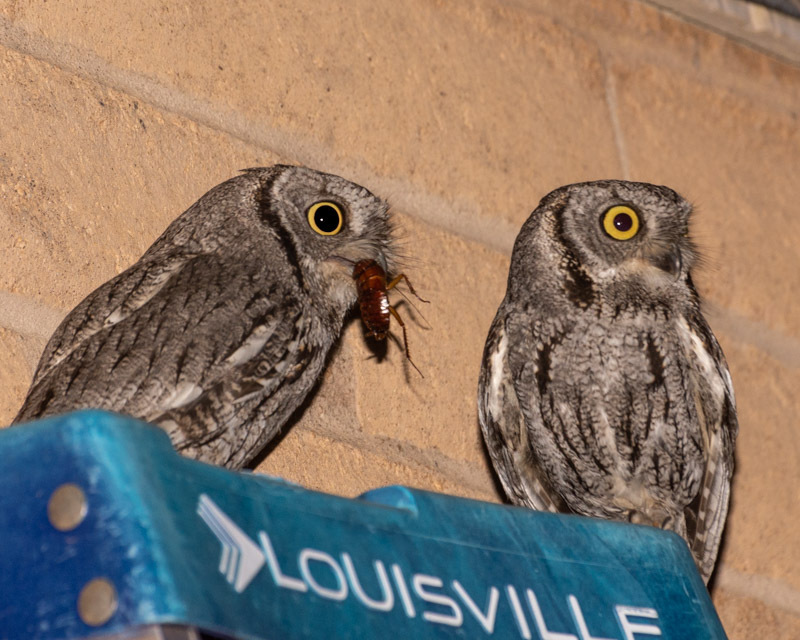 Last year a pair of Western Screech-Owls used the nest box in my yard and raised three owlets. The process took from mid-March until the end of May. 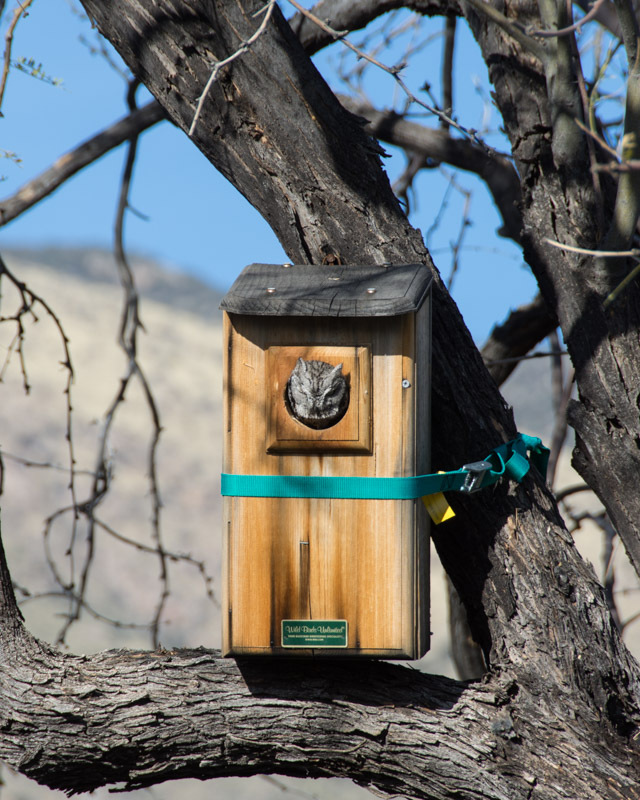 At that time, the family flew off into the desert and the nest box remained empty. 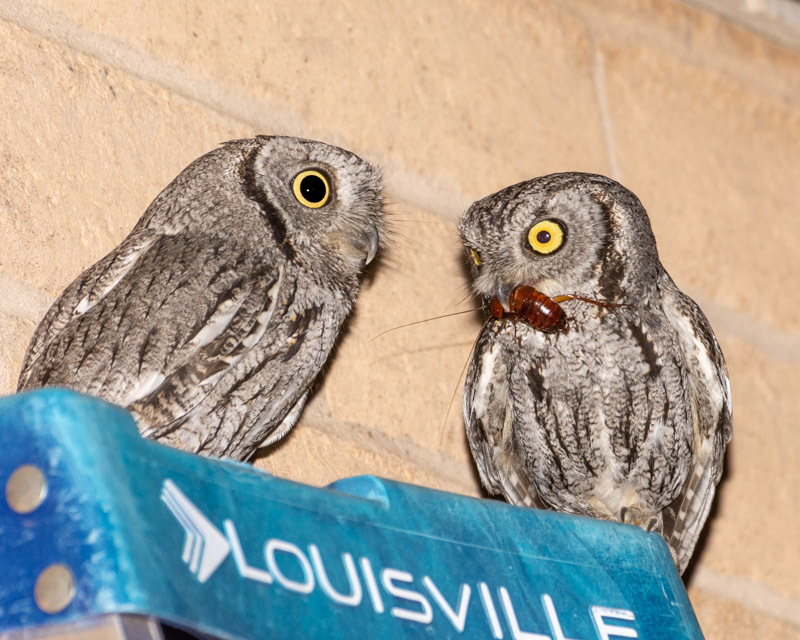 Although I would hear Screech-Owls on and off through the summer, fall, and winter, the box was not used. In mid-March of this year, I saw that the nest box was again occupied, so another year in the cycle-of-life. The female owl will often stick her head out of the box to enjoy the sun and fresh air. 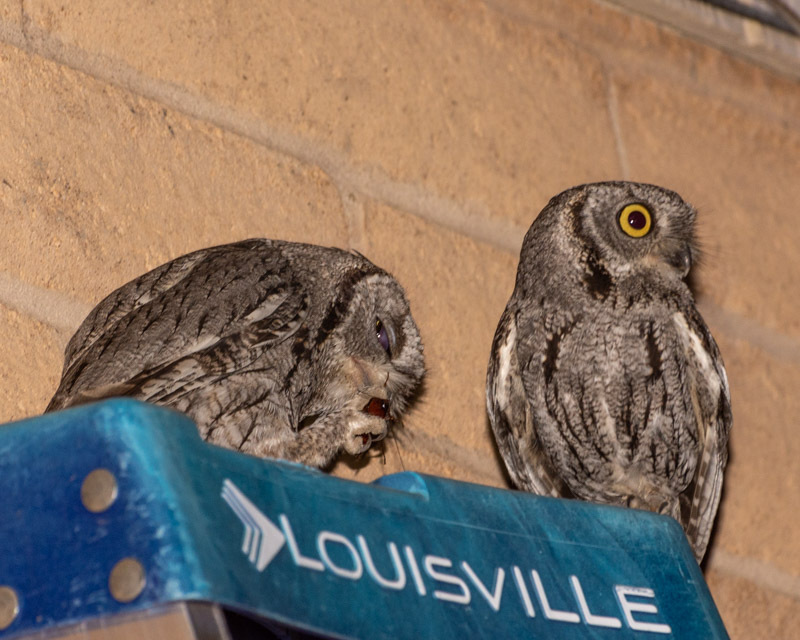 Meanwhile, the male roosts inside of the cinder blocks forming the porch pillar of my neighbor’s house. Something different happened this year. Last year, once I saw the owl in the nest box, I never saw her leave the box for over a month until the eggs hatched. When owls sit on their eggs, usually the female never leaves and the male brings her food while she is on the nest. That is what we witnessed last year. 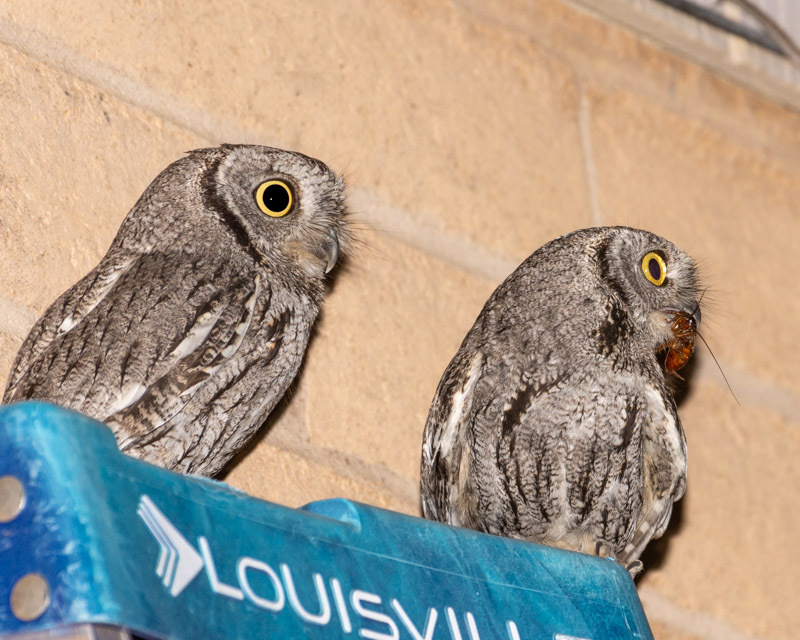 This year, the female is leaving the box almost nightly at dusk, about a half hour after sunset. I wasn’t sure whether or not there were eggs on the nest. Here she is on a mesquite branch in the front yard. It took two weeks until one night when the female did not leave the box. She remained inside, calling to the male who brought her food. I am certain that was an indicator that eggs had been laid. But then, she continued to leave the box the following nights. Sometimes she would land near the house. Other times she flew off into the desert. Friday night I finally figured out her routine. Although she was leaving the box, she remained close to the nest allowing her to return to the nest when she wanted. On the perch below, she looks like she has had enough of me. She remained on that branch for almost 20 minutes calling for the male owl. From the whitewash on the branch, you can assume this is a favorite perching spot for the owls. 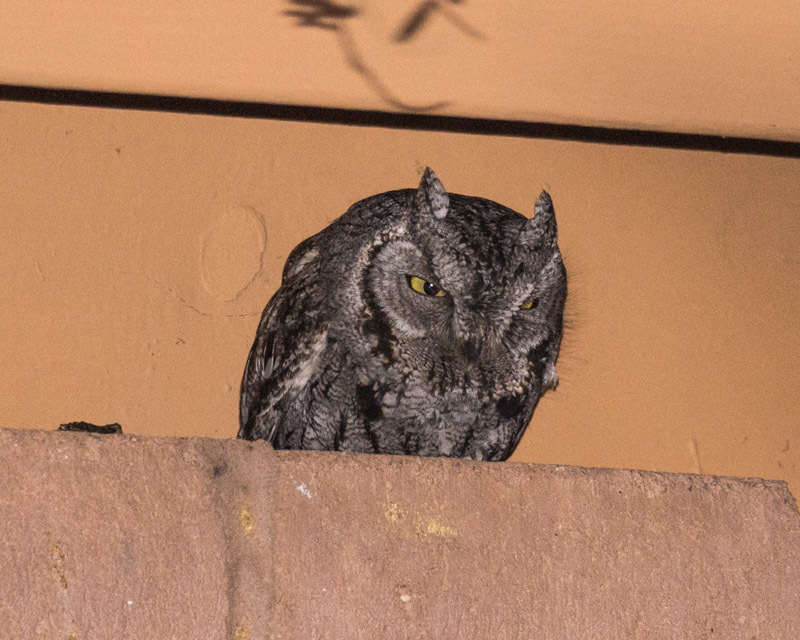 And then, I saw both owls fly around the side of the house. He brought her a snack. 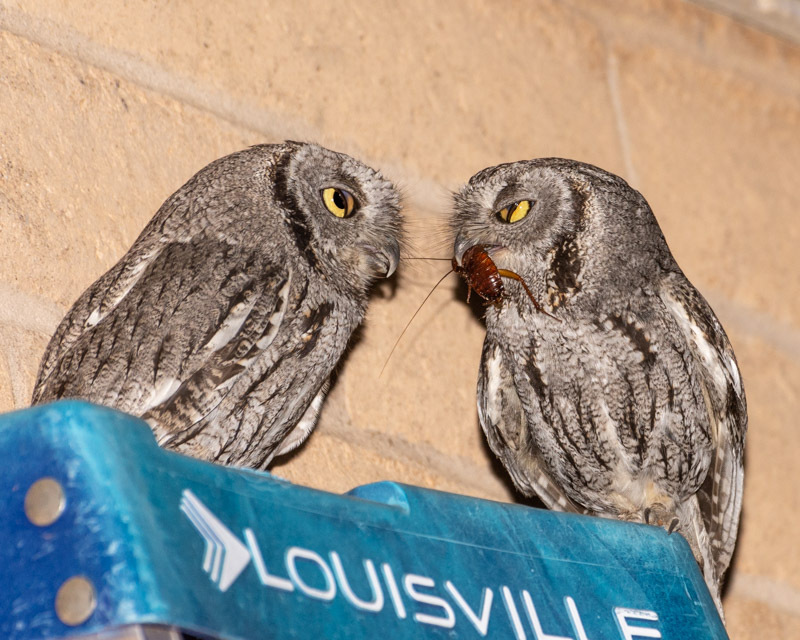 Here, it looks as if neither owl recognizes the fact that the other is sitting nearby. Perhaps they were being alert to other intruders. Then, he looked towards her but downwards, with neither making eye contact. The exchange of the goods….. The exchange is complete and the male looks to the side. She is still looking down and has her nictitating membrane engaged. Now they are both alert, looking out. And dinner is taken, 20 minutes after the female first landed on the ladder. I do believe that their routine is now set. While I wondered about her leaving the nest box, I’m convinced she leaves just to await her meal. If she flies way off into the desert, she then quickly returns close to her nest and then awaits her food deliveries within several yards of the nest. 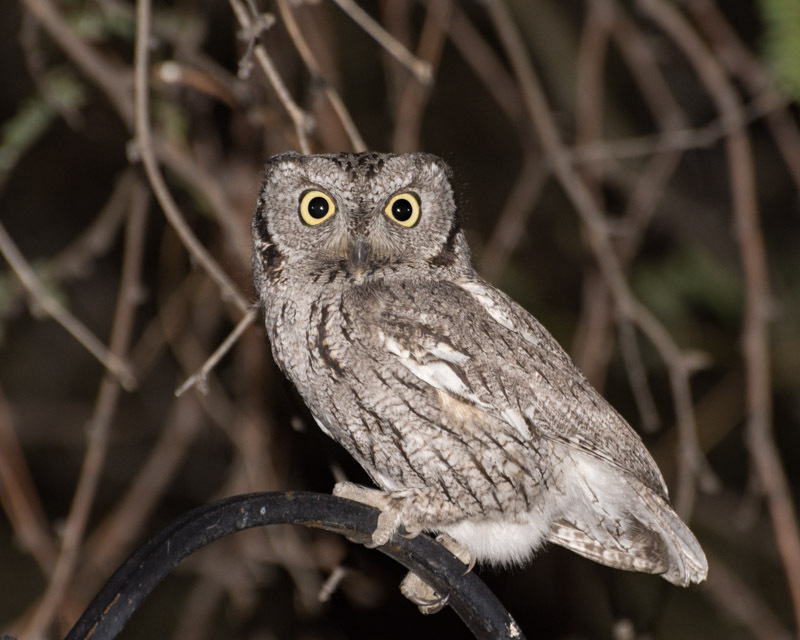 Western Screech-Owls eat a variety of foods. They are carnivores and their diet varies depending on the prey items that are out. 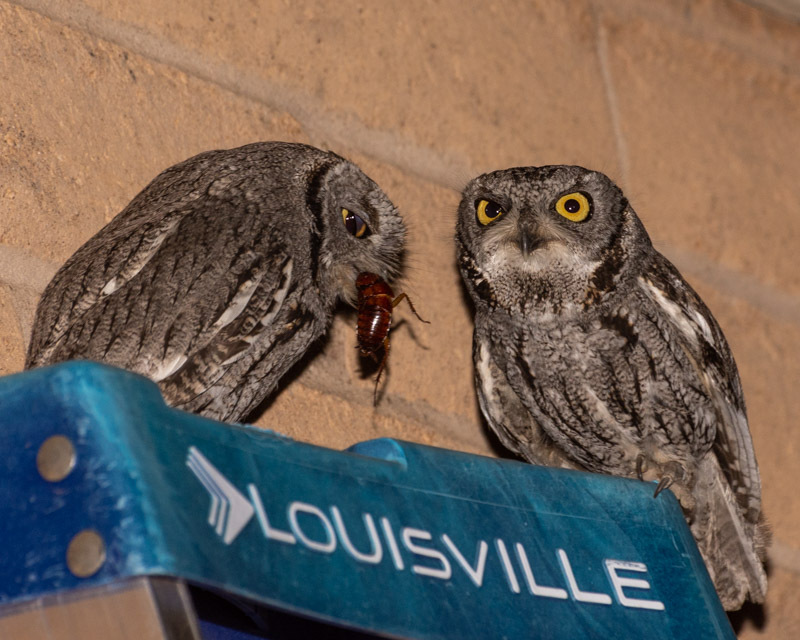 Last year I saw them bring mice, rats, snakes, centipedes, geckos, crickets, cockroaches, and caterpillars to the nest. We’ll see what they hunt this year. I will be sending updates weekly with photos taken during the week. Stay tuned!